The winter capital of Jammu & Kashmir is bluffed on the Shivalik Range, overlooking the northern plains. The city was originally founded by Raja Jamboo Lochan who lived in 14th century BC. According to legend, during one of his hunting campaigns, Raja Jamboo Lochan reached the Tawi River where he saw a goat and a lion drinking water at the same place. Having satisfied their thirst, the animals went their own ways. The Raja was amazed, abandoned the idea of hunting and returned to his companions. His ministers explained that this meant that the soil of the place was so virtuous that no living creature bore enmity against another. He was so struck by this unusual sight that he decided to build a capital city on this land, 'Jambupura', on the right bank of the River Tawi, overlooking his brother king Bahu's fort. This city became known as Jambu-Nagar, which later changed into Jammu. Jammu has historically been the capital of Jammu Province and the winter capital of the erstwhile Jammu and Kashmir princely state (1846–1952). The city name figures in the ancient book Mahabharata. Excavation near Akhnoor, 32 kilometres from Jammu city, provides evidence that Jammu was once part of the Harappan civilization. Remains from the Maurya, Kushan and Gupta periods have also been found in Jammu. Little is known of Jammu’s subsequent history until, in 1730 AD, it came under the rule of the Dogra king, Raja Dhruv Deva. The Dogra rulers moved their capital to the present site and Jammu became an important centre of art and culture, especially the Pahari school of paintings. Today, as if in testimony to Raja Jambu Lochan’s vision innumerable temples and shrines, with glittering ‘shikhars’ soaring into the sky, dot the city’s skyline, creating the ambience of a holy and peaceful city. The city of Jammu has come to be known as the ‘City Of Temples’. Temple of Maha Kali ( better known as Bahu or Bawey Wali Mata), located in the Bahu fort, and considered second only to Mata Vaishno Devi in terms of mystical power was built shortly after the coronation of Maharaja Gulab singh, in 1822. The existing fort, as well as the Manasabdar's palace inside it, was constructed in 1820. Food Tangier preparation made out of mango or tamarind popularly known as maani .Preparations of Rajmash (a special variety of red kidney beans); auria a dish of curd fermented by rye; ambal made from pumpkin, jaggery and tamarind are favourites, especially during ceremonial cooking. Jammu is the winter capital of Jammu & Kashmir and is well connected by all three modes of transport i.e. air, rail and road. By Air: The city has an airport and regular flights run between Jammu and several other cities of the country. All Airlines operate regular daily flights to Jammu connecting different cities. By Rail: Jammu Tawi is an important rail head of the state of J & K and is connected with important towns and cities of the country by express and super fast trains. Jammu Tawi to Kanyakumari is the second longest rail route of India that touches some of the important cities of the country. By Road: one can also reach the city by road. National Highway 1A runs through Jammu district connecting rest of the state including the summer capital Srinagar. Daily bus service is available from Jammu to almost all towns of north India. A number of hotels are available in Jammu suiting every pocket. Jammu city lies at uneven ridges of low heights at the Shivalik hills. It is surrounded by Shivalik range to the north, east and southeast while the Trikuta Range surrounds it in the north-west. The city spreads around the Tawi river with the old city overlooking it from the north (right bank) while the new neighborhoods spread around the southern side (left bank) of river. There are five bridges on the river. The city is built on a series of ridges. The temple was constructed probably in 1889-90 AD by Rani Shuba Devi of Kalhur state wife of Maharaja Ranbir Singh and hence is known as Rani Kalhuri Devi Temple. The temple houses the idols for Lord Rama and Sita on one side and Shiv Parvati Idols on the other side. 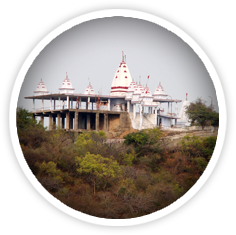 The temple is situated on the Circular Road about half a kilometer from the Peer Kho temple. 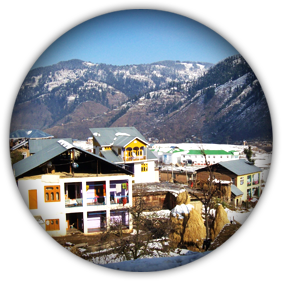 The Panjthirthi locality is situated towards the northern extremity of the Jammu City. This is the oldest part of the City and has a cluster of old temples which are over a hundred years old. 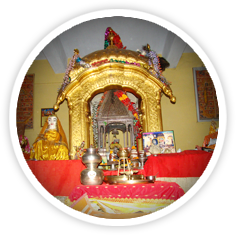 Five Temples in close proximity of each other are considered by the people of Jammu as equivalent to the Panch Tiraths and thus the name Panjtirthi. 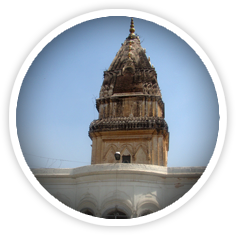 The temple is located near the Billu temple and on the second floor of the temple complex. 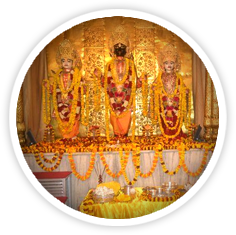 It houses the idols of Shri Satya Narayan Ji and Mata Lakshami Ji. 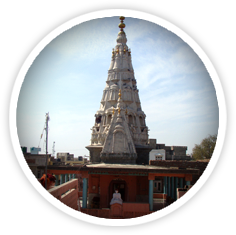 A small adjoining temple has a magnificent idol of Garud DevJi. The temple was built during the reign of Maharaja Partap Singh Ji. 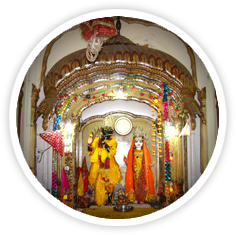 The temple is located in Kacchi Chawni in the centre of Jammu City. It is dedicated to Mata Lakshmi and Bagwan Narayan Ji. 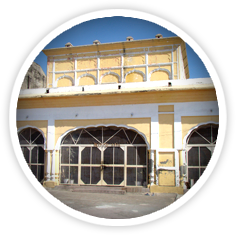 The temple was built by Diwan Jawala Sahai the Prime Minister of both Maharajas Gulab Singh and Ranbir Singh. The temple is a huge structure built in about 1860 AD. It is popularly known as Diwan-e-da-Mandir. The temple is also embilshed with frescoes and murals. This is one of the most important Shakti shrines of Jammu region. The temple is situated inside the Bahu Fort and was built shortly after the coronation of Maharaja Gulab Singh in 1822. 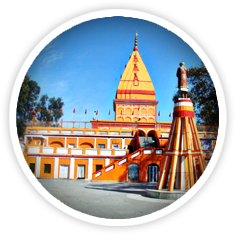 It is also known as the Mahakali Temple, the reigning deity of the City of Jammu. 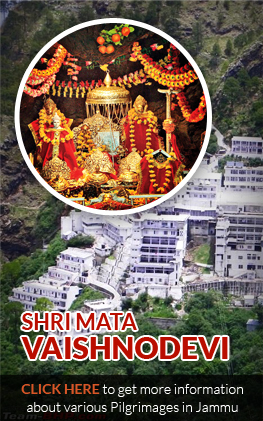 The Shrine is considered second only to Mata Vaishno Devi Shrine. An annual nine day Navrata fair is held during the Navratras. On Tuesday and Sunday, a large number of devotees pay their obeisance to Devi. 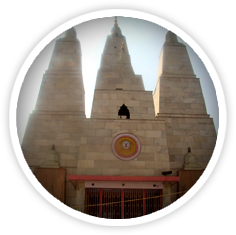 The temple is situated in Sunjama Village near the bank of an ancient pond. The temple houses a redstone Shivlingam. The temple complex has a chatuburji idol of Lord Ganesha. The temple was built in 1861 by Mahatma Kunju during the reign of Maharaja Ranbir Singh. 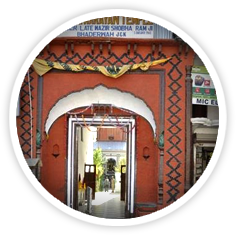 Bhagwan Gopinath Ji Ashram is located at a distance of 5 Kms from Jammu Bus Stand near Udhaywala Bohri. 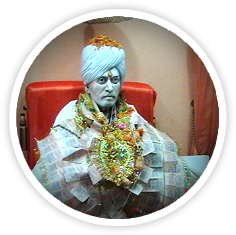 The Ashram houses the marble statue of Bhagwan Gopinathji, who is the most venerated Kashmiri pandit saint. It also has a large library having collection of books of spiritual and academic interest. A heritage gallery showcases the life and teachings of ( Bhagwanji) in the form of relics, models and pictures. 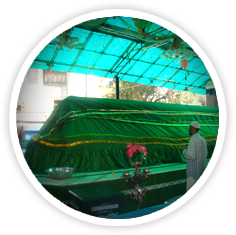 The tomb of Pir Mitha is situated in the old Jammu city in the locality bearing the same name. In the mid of 15th century A.D., a Sayid named Qutul Alam came to Jammu from Sawazwar and made hindus and muslims his followers. He was contemporary of Raja Ajaib Dev, who ruled Jammu from 1423A.D to 1454 A.D. As sugar and sweets were his favourite so most of his followers brought him gifts of milk, sugar and sugar cane. He was also sweet spoken to people as hence was popularly known as Pir Mitha. 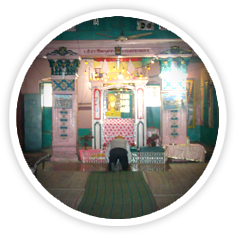 The shrine of Peer Budan Ali Shah situated at Satwari near the Jammu Airport is also popularly known as Peer Baba. Peer Budan Ali Shah was a close friend of Shri Guru Nanak Dev ji. Peer sahib was born at Talwandi in 15th century A.D and was a bachelor throughout his life and a vegetarian, who according to his followers, subsisted on milk. Another shrine of the Peer is said to be at Anandpur Sahib in Punjab. A large number of devotees of all faiths throng the shrine on every Thursday. 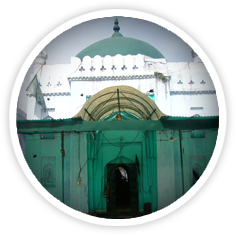 It is the oldest and the biggest Masjid of Jammu located in Talab Khatikan, a kilometer away from Raghunth Bazar. 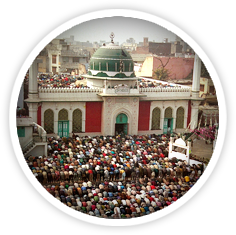 Heavy rush of devotees is witnessed on the eve of Id-ul-Milad and Fridays. 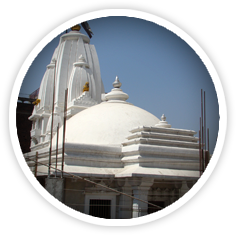 It is one of the prominent Muslim Shrines located at Gumat in the heart of Jammu city near Shri Raghunathji temple. 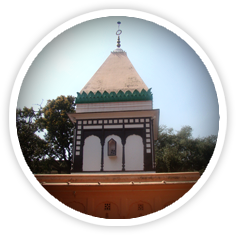 It is the (makbara) mausoleum of Peer Roshan Shah Wali. He is believed to have come from Arabia in 648 samvat and took his abode near Gumat which was then a jungle. After the death of the sage a mausoleum was built at the spot where he resided. This mausoleum has since continued to be the residence of Peers and pious men. The original structure made of stones and clay was rebuilt by Maharaja Ranbir Singh. Pir Roshan Shah was a very tall person and so came to be known also as Pir Nau Gazia ( the nine foot tall Pir). 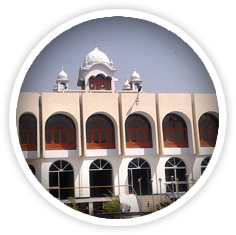 This is a historical Gurudwara of Jammu located just in the vicinity of Raghunath Bazar. 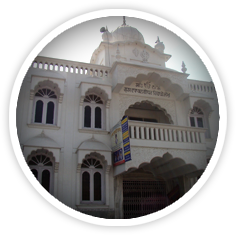 The Gurudwara was built about 166 years back by S. Sunder Singh Khurana Ji who lived in Amritsar. The Gurdwara has beautiful interiors with colourful floral motifs adorning the walls. St. Cathedral Garrison Church (Catholic) on the national highway, was built in 1986 and is dedicated to Rt. Rev. Dr. Hippolytus Kunnunkal, then Bishop of J&K. 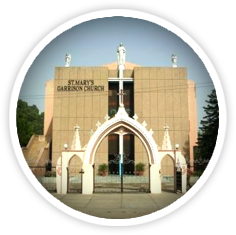 Other churches are Roman Catholic Church near BC Road, St.Peter’s Church, Christian Colony, and Indian National Evangelical Church, Near Ustad Mohalla, Jammu. 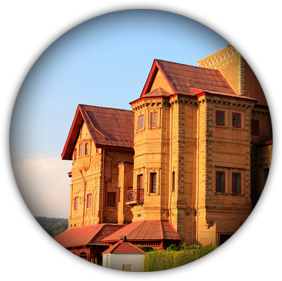 Amar Mahal Palace is the architectural gem located on the National Highway towards Srinagar. 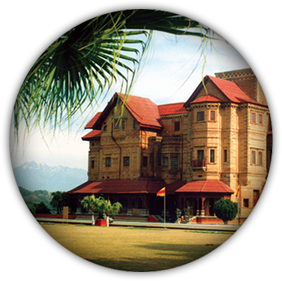 Built like a French Chateau on a hill overlooking the river Tawi, is a beautiful palace of red sand stone which stands amidst most picturesque horizons of Jammu. Once the residential palace of Raja Amar Singh, the palace has been converted into a museum and is looked after by Hari-Tara Charitable Trust. The museum has the golden throne on which Maharaja used to sit, which is made up of 120 kg pure gold. The museum has a gallery of paintings and a library in which about 25,000 books on various subjects and disciplines have been presented. 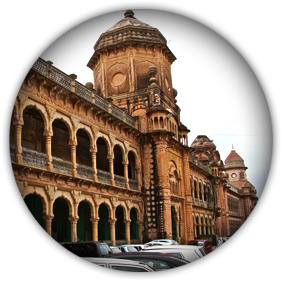 Mubarak Mandi also called the Royal Dogra palaces have a history of more than 150 years. A very beautiful architecture, blended with Baroque, Mugal, Rajasthani and European styles, attracts the tourists in large number to this spot. The most striking sections of the complex are Sheesh Mahal, Rani Charak Mahal, the old Army Head Quarter, the Foreign Office and the Grey Hall where the Maharaja used to hold his Darbar. 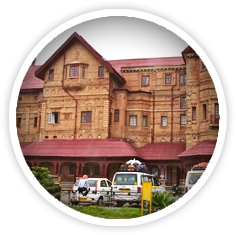 The Mubarak Mandi Complex includes the famous Dogra Art Gallery situated in the erstwhile Pink Hall. The museum is a treasure house of miniature paintings from the traditional Hill Schools of art especially the Jammu School of Art, Kangra School of Art and Basohli School of Art. The collection includes hundreds of rare pictures, a gold bow and arrow of the Mughal king Shah Jehan and also hand written Persian manuscripts of Shahnama and Sikandernama. This complex surrounds a beautiful courtyard and a fabulous garden. The ancient Bahu Fort in Jammu is believed to be originally built by Raja Bahu Lochan about 3,000 years ago. It was refurbished by the Dogra rulers in the 19th century. 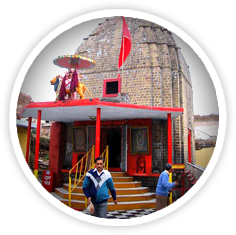 The fort is a religious place and within its precincts is a temple dedicated to the Hindu goddess Kali, the presiding deity of Jammu. 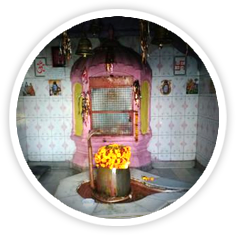 The temple is known locally as the "Bawey Wali Mata temple”. Just beneath the fort is the terraced Bagh-e-Bahu Garden laid in the style of Mughal gardens which affords panoramic view of the Jammu city and underground fish aquarium. 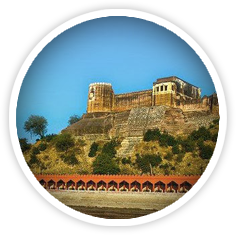 The Fort was built during the early 19th century and commands a towering view along the right bank of the Chenab. 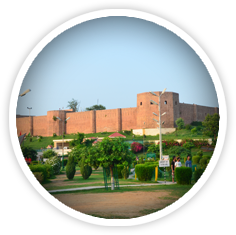 The present fort was probably started in 1762 AD at the behest of Raja Tegh Singh, as an autonomous principle state. A devastating famine is said to have broken in the country during this time. In order to provide work to his famishing people Raj Tegh Singh started the construction of Akhnoor Fort and Palace on banks of the Chenab River. He supplied food to the workers for 2 years and thus saved the principality His son Alam Singh completed the Akhnoor fort in 1802. On the eastern side, there are steps leading down to the River Chenab. Though constructed in the 18th century, most of the steps are in a good state of preservation. The ghat served as the important spot for performance of religious sites by the people of the region. The turrets or Burj are still intact is called the Kishore Singh Burj after Maharaja Gulab Singh's father who was a close associate of Guru Gobind Singh the 10th Sikh Guru. There are traces of paintings on the walls of the rooms of the fort. Ambaran ,also locally known as Pambaran, is a village of Akhnoor tehsil in Jammu district and is said to have been founded by Amba Jagdev Pawar . A scion of Pawar dynasty of Dhar Ujjain which seems to have been the original capital of Akhnoor. 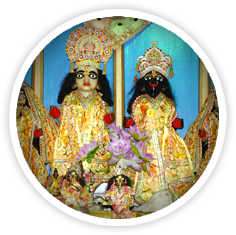 It was named Ambari after the family diety Amba, one of the names of goddess Durga. The name got changed gradually into Ambaran. Ambaran is the eighth place in the world, where relics of Buddha have been found in a stupa. Historians are of the opinion that the place might have been an important centre of Buddhism between the 1st and 7th century B.C. A cultural sequence of four historical periods has already been unraveled at Ambaran. It is believed to be the only early Buddhist site in Jammu region. Excavations have unearthed terracotta figures, small sculptures, pottery and brunt brick structures dating back to pre Kushan and post Gupta period. 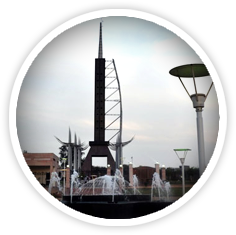 Located at a distance of 40 Kms from Jammu off the Jammu – Pathankot highway. 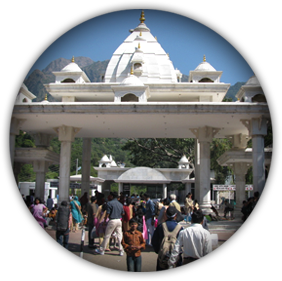 Purmandal is one of the most visited pilgrim spots in Jammu. 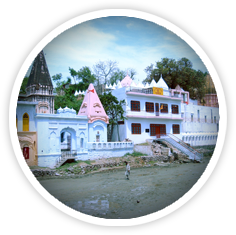 Also called “Chhota Kashi” – Mini Varanasi, the main temple complex here is dedicated to Lord Shiva in the aspect of Umapati. There are other temples too dedicated to Radha-Krishana and Raghumnath Ji. 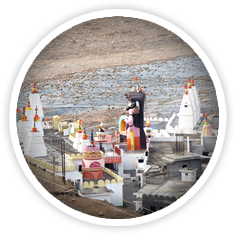 It is located on the banks of the sacred Devika river which is mostly flowing underground and is thus also called Gupt Ganga. The temple complex was built by Maharaja Gulab Singh in 1843 though it is believed that the earliest temple here dates back to sometime in the 6th – 8th century AD having been built by King Veeni Dutta of Avantipur, Kashmir. 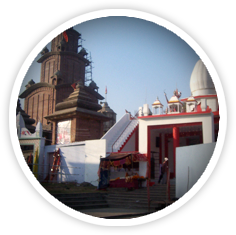 A major festival is held here on Shivratri. 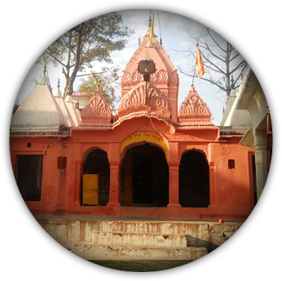 About 3 Kms from Purmandal is Uttarbehni (North Flowing) another important temple complex of the region. 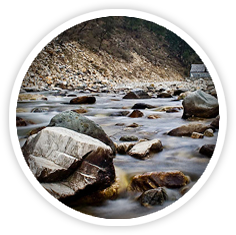 As the name would suggest, the river Devika here takes a turn and flows northwards which is rare for rivers in the world. 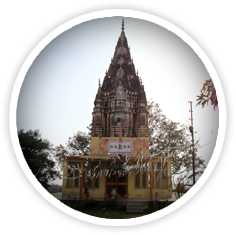 The Gadadhar temple here was built by Maharaja Gulab Singh in 1850. 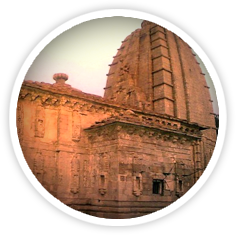 The other temples dedicated to Lord shiva were built by his successors. 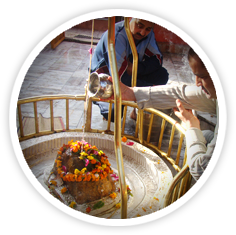 The Shivling in the Abhibhakteshwar temple is claimed to be the biggest in India. Devotees from all over the region congregate here on Shivratri, Chaturthi and amavas. Jhiri is located about 20 kms from Jammu, off the Jammu-Akhnoor highway. The Centuries old famous Jhiri Mela is held every year during the Karthik Purnima (late autumn full moon) falling in the last week of October and early November. Lacs of devotees throng the village to commemorate the martyrdom of Baba Jittoo, a farmer who gave up his life in protest against the oppressive demands of the zamindar about 500 years ago. Further ahead, 35 Kms short of Jammu on the National Highway is Jhajjar Kotli, Tourist Complex, built on the banks of the Jhajjar Rivulet. The crystal clear, cool waters of Jhajjar attract picnickers in large number especially during summers. A Tourist Cafeteria, a Bar and a small Tourist Bunglow are provided here by JKTDC. Moving further towards Jammu, one can also stop at the ancient Rani ka Talab. 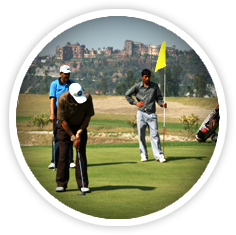 Another landmark of Jammu is the Jammu Tawi Golf Course located in Sidhra on the outskirts of the city. Situated on the bank of river Tawi and the foothills of the Shivaliks, it is a fascinating recreation of nature. 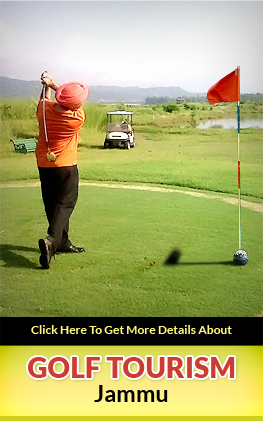 This wonderful 18 hole eco-friendly splendor is spread on 1385 kanals of lush green land. With the imposing backdrop of the Trikuta mountains, Jammu Tawi Golf Course opens to a breathtaking panorama of clean waters of serpentine River Tawi and affords the charming view of the distant Amar Mahal Palace, Hari Niwas Palace and Mubarak Mandi Complex on one side and the Bahu Fort and Mahamaya Temple on the other. It is perfect example of amalgamation of modernity with heritage. A 2 km long promenade bordering the Golf Course along River Tawi is the most salubrious facility for joggers and a scenic attraction for tourists. In the times to come, this golf course will prove to be a great Golfing Destination for both domestic and international golfers. The sacred soil of Jammu & Kashmir has been the battleground for several wars and the state has given some of the finest soldiers to the armed forces of the nation. To show eternal gratitude to the martyrs of various wars fought in J&K since independence, the Indian Army conceived a unique war memorial at Bahu Wali Rakh near the historic Bahu Fort and named it ‘Balidan Stambh’(the monument of sacrifice) in Jammu. Balidan in Hindi means "Sacrifice" and Stambh means a "Pillar". 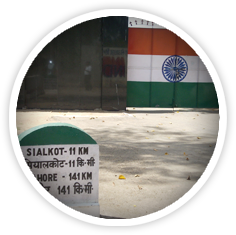 It has a Memorial Pillar constructed in memory of the martyr soldiers. Balidan Stambh is a perfect historical and emotional rendezvous for the people of Jammu region. This Balidan Stambh also epitomizes a vibrant linkage of rest of the country with Jammu & Kashmir. It is here that the soul of our fallen heroes will rests in peace. It is located on the way to Bahu fort. This place is about 3.5 kms from RS Pura and has a very good potential to attract tourists. It is a low lying wetland area having water 4-5 feet spread over an area of approx. 1.5 sq.km. A number of migratory bird species from Siberia and other countries nests here between November to April every year and is a perfect place for bird watchers and ornithologists. During these months the peaceful atmosphere of this village is jostled by the chirping of variety of beautiful birds which flock to this place from different arctic and Scandanavian countries. The wetland is close to Indo-Pak Border (appx. 20 Kms. 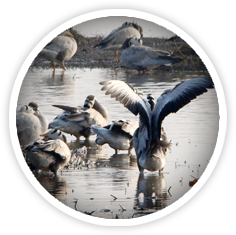 From Jammu) and has been notified as a protected water body and declared as important Bird Area (IBA). Historically, R.S Pura being as an important railway station of undivided India in pre British times. It is 28 kms from Jammu and the border between India and Pakistan lies 9 kms from R.S Pura and is known as Suchetgarh border. This border town is on Westside of J&K state. The forest Octori Post for the state was at Suchetgarh and hence has a great historical importance. 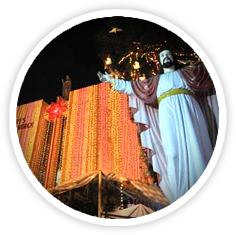 This is one of the oldest church and is located just in the vicinity of Tourist Reception Centre, Residency Road, Jammu. Rev. A.G Cowie, the founding pioneer of Alexander Memorial School was granted permission by Sir Partap Singh, Maharaja of Jammu and Kashmir in 1911. 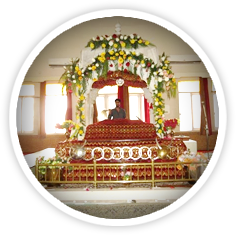 The Gurudawara Sahib was made by Baba Bhagat Singh Ji and his wife Mata Tej Kour ji in 1947. Baba Bhagat Singh Ji was the follower of Baba Alibegh Ji. 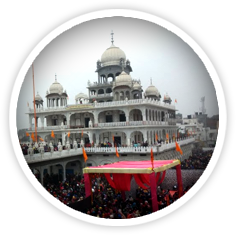 The Gurudwara is popularly known as Gurudwara Chatti Padshahi Tali Sahib Ji .This is an ancient and revered Gurudawara located at Talab Tillo. 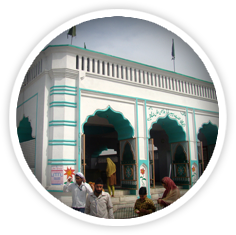 This dargah is situated at a little distance from the Maharaja's palace on the Jammu-Srinagar National Highway. The place is known because five peers (Holymen) lived here and dedicated themselves to meditation. 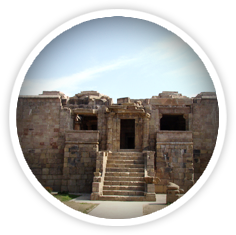 It is probable that the peers came and settled here during the time of Maharaja Gulab Singh. 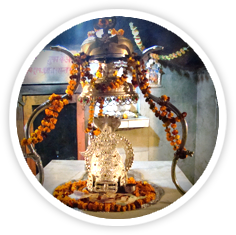 Baba Rah is well known shrine in Jammu located at Gandhinagar area. Rah became popular because of his humanitarian activities during the time of Maharaja Pratap Singh of Jammu( 1885-1925A.D) and came from Nur Jamol , a village now in Pakistan. 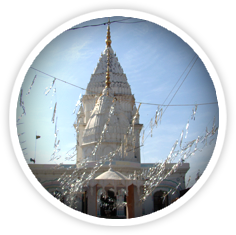 The temple is located at Purani Mandi in the heart of Jammu city. 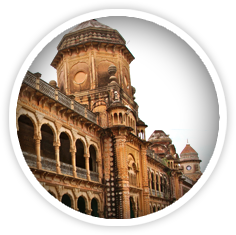 It was built by Rani Bandrali Devi wife of Maharaja Ranbir Singh in 1890-91. 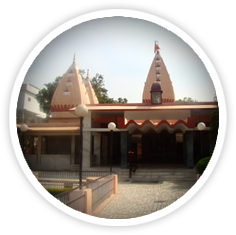 The temple houses the images of Lord Rama and Mata Sita. 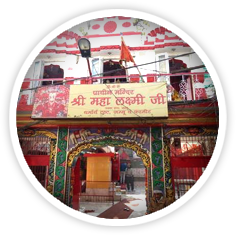 The entrance door has the images of Mata Ganga and Jamuna.The temple complex has small temple of Lakshmi Narayan Ji and Mata Durga. The temple was constructed during the reign of Maharaja Gulab Singh and is located on the slope to river Tawi from Panjtirthi on the Circular Road. The temple is dedicated to Lord Balram Ji , the elder brother of Lord Krishna & is named so as Lord Krishna used to address his elder brother as ‘ Dau’. This temple was built by the Dogra family to which Maharaja Gulab Singh belonged, probably in 1820. Later on Maharaja Ranbir Singh( 1857 – 1885 AD) also built temples in the vicinity of this shrine. 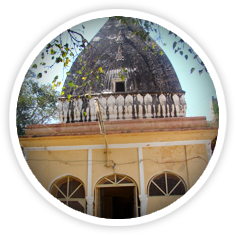 The temple is dedicated to Raghunath ji and located on the lower end of the Dhakki Parmeshwari near the bank of Tawi, east of the city. When one travels, he/she will get to know places and meet many different cultures. 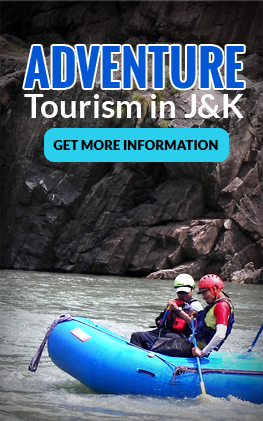 Jammu is a vibrant place of interest where tourists visit typically to quench their thirst for pilgrimage, leisure, VFR, natural and built beauty and heritage. Besides being the start point of Mata Vaishno Devi & Shri Amarnath Pilgrimage, the Jammu has peculiar things to offer which are unparalleled to contemporary tourist destinations. The uniqueness ranges from impeccable Basmati Rice & exotic Dogra cuisine to Suchetgarh International border outpost, from Gharana wetlands to Shikara, Pahari, old nagra style temples and so on. Moreover, the hosts are courteous & extremely hospital and geographic location of the town is its main USP.